Book FAQ: Is the Book “Predictive Analytics” Only for Experts? No! When you invest the time to read a book, you’re investing a lot more than the $17 to buy it. FAQ: Is Predictive Analytics for practitioners and experts? Easily understood by all readers, Predictive Analytics is a conceptually complete primer for non-scientists (like a textbook) – but disguised as an entertaining “pop science” business reader. Rather than a “how to” for hands-on techies, the book entices newcomers and experts alike by covering new examples and the latest state-of-the-art techniques. A kind of “pre-how-to,” the book introduces the critical concepts for any would-be practitioner. After reading the book, you are directed elsewhere by its Notes section for the technical “how to” and advanced underlying math. Like a primer in economics or biology, if you are pursuing a career in the field, this book will set the foundation, yet only whet your appetite for more. 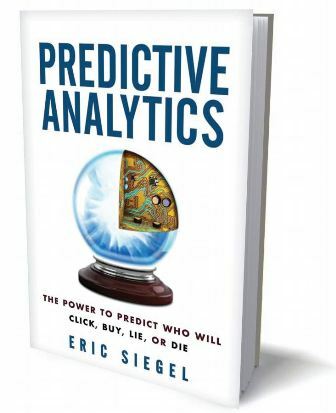 While there are a number of books that do approach the “how to” side of predictive analytics, this book serves a different purpose. I took on what turned out to be a rewarding challenge: sharing with a wider audience a complete picture of predictive analytics, from the way in which it empowers organizations, down to the inner workings of predictive modeling. With its impact on the world growing so quickly, it’s high time the predictive power of data – and how to scientifically tap it – be demystified to reveal its intuitive yet awe-inspiring nature. Learning from data to predict human behavior is no longer arcane.